The Tone River is flooding! What should we do? The Tone River gives much joy and blessings to our lives, but it can change into a terribly fearful river. This is a fun guide to help us live in safety by giving us hints of what to do if danger strikes, using records of past floods, the river's particular nature and what to do if near the river. Maps detailing the entire Tone River area available. 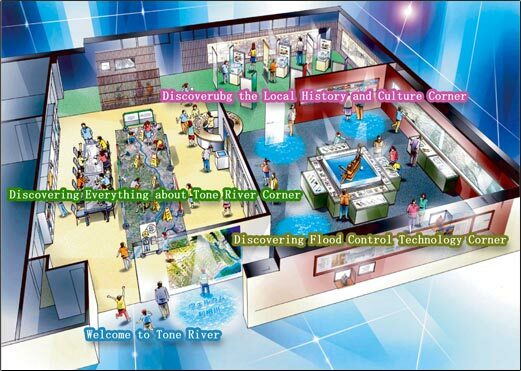 Provides study courses on everything about the Tone River, from basic outlines through to information on flood control, with the use of maps and panels. Provides study courses on the canal (steamships) that prospered in ancient times and the abundant fish resources (types of fish and types of fishing,) based on a theme entitled The Riches and Canals of Tone River. Provides study courses on how families coped with water damage (water mounds) and what the river was like before flood barriers were in place (circular levees,) based on a theme entitled Knowledge Required to Live by Tone River. Provides history lessons in which the past is reproduced on video and with models. Provides study courses on all of the mechanisms enacted to prevent flooding, from the history of flood damage and flood control technology, through to current anti-flooding technology. Provides study courses that enable participants to fully understand the machinery used to prevent water damage and for dredging purposes, and the situation prevalent during those times. Provides close-up views of the actual vehicles currently used for preventing disasters.